Stepping outside of my comfort zone. When I was six, my father bought me a violin and that was a life-changing gift. I wouldn’t say I was a mind-blowing talent but I was good with music and I enjoyed spending time studying it. At the age of ten, I started to give small concerts. At first for my family and our circle of friends; months later, I was playing on the scene of the School of Fine Arts in my hometown. I can recall how nervous I was at every single concert. However, once I started to play, I was entering a state of ease and flow and my violin became my best friend. Years later, I was working for a multinational corporate. At first in Romania, later in Sweden and China. During my time with this company, I was involved in important business projects and my leadership role in the organization required me to speak in management meetings or in front of my team. I have to confess that wasn’t always easy. Speaking in public was very different from playing an instrument in front of others. During those small concerts, my violin was there with me and that was a tremendous source of comfort. It felt like I wasn’t alone. What I didn’t realize at that time and what I know to be true today is that I was facing serious self-esteem and confidence issues. Perfection was my worst enemy and nothing I was doing felt good enough. The truth is I needed people to like me because I didn’t like myself enough. Speaking in front of people outside of my comfort zone was one of my challenges for many years. It made me feel nervous and sometimes stuck. When in front of bigger audiences and with people I wasn’t familiar with, my fingers were tingling, my pulse got faster and I could feel my heart beating up through my throat. I tried the old trick and imagined my audience naked. It didn’t work out well; I could feel how I was faking it. The people I had in front of me were not naked, they had their clothes on, and that was what I had to learn how to deal with: reality. The first one is very simple, but it made a tremendous positive change in the quality of my speech. Holding a pen in my hand while speaking helped me to get more centered and balanced. It was like holding a bow in my right hand and having my violin with me, instead of being completely alone. Secondly, I made friends with my fear. I stopped feeling weak because I was afraid. I learned how to embrace my fear as part of the package of being human. I recognized that, in the case of public speaking, the intention of fear was to protect me from harm and the emotional injury of not being liked, not doing a good job, not transmitting my message well. The moment I turned my fear from an enemy into a protective friend, everything changed. My fear was still with me, but it was there to support me and keep me safe. So thank you, fear, for wishing me well. Thirdly, I detached from other people’s opinion of me. 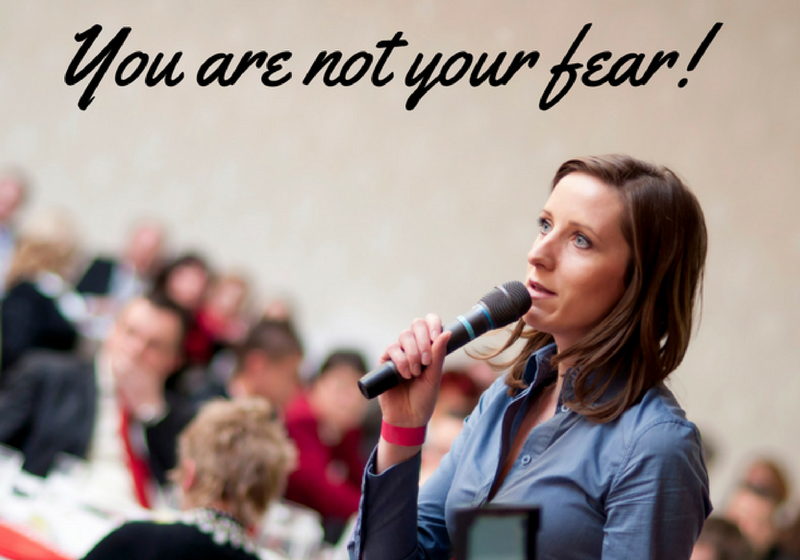 Did you know that among all fears, the fear of public speaking comes first? Even the fear of death ranks second! Since an early age, many of us have been raised to take other people’s opinions into account, and so it is no surprise we show up in the world trying to fit into someone’s expectations. On top of that, being liked, accepted and appreciated by others is a basic human need, as described by Maslow in his pyramid of human needs. I believe that looking for self-validation through other people turns us into their prisoners. If we worry what other people think about us, we are focusing on them and what they might think, instead of keeping our focus on ourselves and the message we want to deliver. We can’t control what other people feel and what they think about us, but we are in charge with our feelings, thoughts, and emotions. When I know that what other people think of me has nothing to do with me and it doesn’t define me, I set myself free from any judgment. What they see in me is their opinion and what they filter when they look at me. Some might perceive me as smart, funny and talented; others might think I’m an average public speaker — or even a lousy one. To some, I might look gorgeous, to some I might look too fat. No matter other people’s thoughts about me, it’s all about their standards of beauty or intelligence and it all has zero to do with me. And last but not least, my confidence boosted once I learned new skills and acquired some practical information on public speaking. From planning for a speech to keeping my audience interested in the topic and inspired to know more. Practice is essential! The more I dared speaking out, the easier it became. My manager at that time gave me an additional assignment I loved: to be a trainer for my organization. One day, I even delivered a presentation skills training and that went beautiful and smooth. I couldn’t believe how much I enjoyed doing it — like fish in the water! Today, I start all my speeches with the intention of doing the best I know and the best I can. There is no need for perfection. I have learned how to make a mistake and get over it gracefully instead of punishing myself for making it. There is no reason to impress anyone, no self-blame, no pressure. Pure freedom! Speaking about topics I love and sharing my knowledge has turned from a source of high stress to a source of genuine joy and fulfillment. Originally published at sarafabiancoaching.com on April 20, 2017. #1 Fear Worldwide is not Death, it’s Public Speaking!! !